When a movie debuts in 2015 but gets no form of wide distribution until 2017, that looks like what we call a “bad sign”. When the aforementioned “wide distribution” comes largely from home video, that’s an even worse omen. Despite all those negatives, 2015’s The Blackcoat’s Daughter looked interesting enough for me to give it a whirl. At a Catholic boarding school in upstate New York, the students head out on break. However, two of them – Kat (Kiernan Shipka) and Rose (Lucy Boynton) – remain stuck at the school when their parents fail to retrieve them. Kat intentionally tricked her family to delay their arrival, whereas the absence of Rose’s clan seems more questionable. In addition, a troubled young woman named Joan (Emma Roberts) struggles to make her way into the same part of New York as the school’s location. We follow her path as we wait to see how the two tales intersect. Would it count as a spoiler to indicate that the plot traces a creepy track with supernatural surprises along the way? Probably not, as the movie makes its unsettling core clear from the very start. The biggest question involved in Daughter stems from the directions its characters and narrative will follow. The film comes with the slowest of all possible slow builds and only starts to really develop those spooky/supernatural elements as it gets into the second act. This makes the movie a semi-challenging ride for its opening, as the viewer may become impatient to learn where it will go. Outside of the basic story elements I mention above, we don’t get a lot of depth, so we’re left with faith that the story will eventually head somewhere interesting. The main reason I can’t count any indications of the film’s creepy vibe as “spoilers” comes from the ominous manner in which director Osgood Perkins tells the tale. He doesn’t give us a story that places the audience in a benign environment with horror to follow – no, Perkins treats even the simplest of interactions in a manner that connotes dread. On the surface, this choice shouldn’t work, as it might feel like Perkins tries too hard to force a creepy tone on us before he earns it. In theory, I’d prefer a movie that builds tension via actions and lacks the borderline over-the-top dark vibe we get here. Perkins’ choices work, though, as the spookiness manages to draw in the viewer. We find ourselves curious to find out what will manifest to merit the eerie tone and latch onto whatever events we see. As implied earlier, matters become more heated when the first act moves into the second, as Daughter offers plot information that threatens to derail the narrative. I feel that way because Perkins gives away information that makes many mysteries patently evident. Obvious I won’t detail these spoilers here, but I will state that the movie lacks real surprises once a particular revelation occurs. Again, this should turn into a fatal flaw, but it doesn’t. Perkins weaves an intriguing enough world that even without much mystery, Daughter remains compelling and carries us with it. A final potential drawback comes from the manner in which Daughter alludes to earlier movies. It doesn’t take much to draw stylistic and narrative links to flicks such as The Shining, The Exorcist and Rosemary’s Baby, among others. 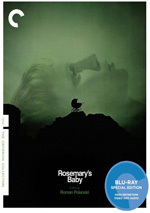 Perkins wears these influences on his sleeve and barely attempts to obscure them – heck, he even names “Rose” after Rosemary’s Baby! In most films, this would make the end result seem derivative, but somehow Daughter manages to resist that fate. Even with the obvious connections to other movies, it still gives us a tale that comes across as something of its own and not just a series of references to its forebears. All of these factors make Daughter an unusual piece of work, as it comes with a load of potential problems. However, it creates a creepy, involving world that grabs the viewer and doesn’t let go. The Blackcoat’s Daughter appears in an aspect ratio of approximately 1.85:1 on this Blu-ray Disc. The movie came with a fairly good presentation. Given the movie’s somber tone, I felt unsurprised by its low-key palette. The film emphasized muted browns and blues, all of which looked appropriate for the design choices. Blacks were fairly dark and dense, while shadows seemed more than acceptable. Low-light shots could be a bit murky, but that appeared to be intentional. All of this led to a generally pleasing image. If you activate the movie’s subtitles, you’ll see many references to “ominous ambience”, and that term accurately describes the DTS-HD MA 5.1 soundtrack. While devoid of “big” moments, the mix provided a consistently spooky auditory experience. This meant an emphasis on eerie music and general environmental information. A few scenes such as a storm and in a car offered a little more direct involvement, but the majority of the mix focused on the aforementioned “ominous ambience”. In that regard, it fared well. Though we didn’t get material that stood out as memorable, the track used the five channels in a creepy, disturbing manner that helped add impact to the movie. Audio quality seemed fine. Speech remained natural and concise, while effects displayed nice accuracy. Music was full and offered the necessary spookiness. This ended up as a satisfactory soundtrack. A few extras fill out the disc, and we open with an audio commentary from writer/director Osgood Perkins. He provides a running, screen-specific look at story/characters, influences, cast and performances, sets and locations, cinematography and visual design, music and connected areas. Despite a few lulls, Perkins offers a mostly strong commentary. He covers a good array of topics and does so in a frank and engaging manner. This turns into a likable and informative chat. The Dead of Winter: Making The Blackcoat’s Daughter runs six minutes, 56 seconds and includes remarks from Perkins, producers Rob Paris and Adrienne Biddle, composer Elvis Perkins, and actors Emma Roberts, Kiernan Shipka, James Remar, Lauren Holly and Lucy Boynton. “Winter” looks at story and characters, sets and locations, cast and performances, and music. This is a basic overview without much depth. The disc opens with ads for The Witch, The Monster, Trespass Against Us, The Sea of Trees and Green Room. No trailer for Daughter appears here. A second disc offers a DVD copy of Daughter. It includes the same extras as the Blu-ray. 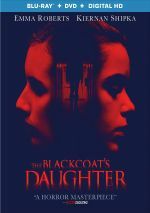 Creepy and atmospheric, The Blackcoat’s Daughter offers a suitably effective horror tale. While some of its choices don’t pay off as well as I’d like, in the end the movie packs a good punch. The Blu-ray offers mostly positive picture and audio along with an interesting commentary. Due to its pacing, Daughter won’t be for everyone, but I like it.